High levels of MGO or hydrogen peroxide usually produce the most active honey, however, the correlation is not always perfect suggesting other components of honey may modulate activity (Molan, 2008; Kwakman et al., 2011; Chen et al., 2012; Lu et al., 2013). Bee defensin-1, an antimicrobial bee-derived peptide is responsible for activity in Revamil honey, an active honey produced from an undisclosed source, but this appears to be structurally modified and inactive in manuka honey (Kwakman et al., 2011; Majtan et al., 2012). The level of leptosin, a glycoside found exclusively in Leptospermum honey, correlates with potency and may modulate the antimicrobial activity of manuka honey (Kato et al., 2012). Similarly, various phenolic compounds with potential antimicrobial activity can be present, particularly in darker colored honeys, and although these occur at levels that are unlikely to be inhibitory on their own they may synergize with one another or other components of honey to produce or alter activity (Estevinho et al., 2008; Stephens et al., 2010). Phenolics can also act as antioxidants and may be responsible for anti-inflammatory and wound-healing properties of honey (Stephens et al., 2010). It should be noted that not all Leptospermumspecies produce active honey, and even within L. scoparium and L. polygalifolium honey MGO levels can range from ∼100 to >1200 ppm (Windsor et al., 2012). A survey of Australian honey activity found honey sourced from Leptospermum plants growing around the New South Wales–Queensland border was particularly active, but whether this is due to plant, soil, climate or other factors is not known (Irish et al., 2011). As well as inhibiting planktonic cells, honey can disperse and kill bacteria living in biofilms. Biofilms are communities of cells that are generally enclosed in a self-produced extracellular matrix and found adhering to surfaces, including wounds, teeth, mucosal surfaces, and implanted devices. Microbes resident in biofilms are protected from antimicrobial agents and they can cause persistent, non-resolving infections. Manuka honey disrupts cellular aggregates (Maddocks et al., 2012; Roberts et al., 2012) and prevents the formation of biofilms by a wide range of problematic pathogens, including Streptococcus and Staphylococcus species, Pseudomonas aeruginosa, Escherichia coli, Proteus mirabilis, Enterobacter cloacae, Acinetobacter baumannii, and Klebsiella pneumonia(Maddocks et al., 2012, 2013; Lu et al., 2014; Majtan et al., 2014a; Halstead et al., 2016) Importantly, honey can also disrupt established biofilms and kill resident cells, although a higher concentration is required than for planktonic cells (Okhiria et al., 2009; Maddocks et al., 2013; Lu et al., 2014; Majtan et al., 2014a). Very recently, manuka honey was tested on a multispecies biofilm containing Staphylococcus aureus, Streptococcus agalactiae, Pseudomonas aeruginosa, and Enterococcus faecalis and was found to reduce viability of all species but E. faecalis, which could not be eradicated (Sojka et al., 2016). 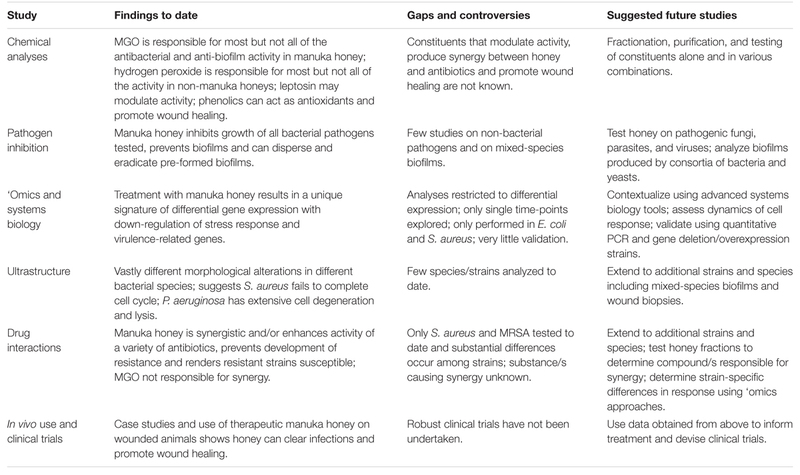 This has clear clinical implications for using honey on wounds containing biofilms, and understanding how the biofilm enables E. faecalis, to survive when it is normally killed by honey is an important and interesting area of future study. MGO appears to be mostly but not fully responsible for the inhibition of biofilms by manuka honey, again highlighting the importance of additional components that modulate activity (Kilty et al., 2011; Lu et al., 2014). Understanding how honey affects the action of antimicrobials with well-characterized modes of action may also further our understanding of how honey affects bacterial pathogens. Liu et al. (2014)extended the analysis of synergy to include additional antibiotics and different S. aureus and MRSA strains. They suggested that an increased susceptibility to clindamycin and gentamicin might result from the combined effect of down-regulated protein synthesis by honey with inhibition of ribosomes by the antibiotics, while synergy with β-lactam antibiotics could be due to increased oxidative stress caused by both partners. As S. aureus and MRSA strains were equally susceptible to the oxacillin-honey combination it appeared that synergy was unlikely to be due to PBP2A down-regulation. In one clinical MRSA isolate, however, there was no increase in sensitivity to clindamycin or gentamicin when honey was present, which is notable as it is the first reported case of a difference in response to honey by MRSA versus S. aureus. Investigating this strain-specific difference using transcriptomic or proteomic analyses would be an interesting avenue for future research (Liu et al., 2014). This review was written by DC, SB, NNC, DB, and PB and was critically reviewed by RS and EH. NNC receives salary support from the Rural Industries Research and Development Corporation – Honey Bee Program (Grant PRJ-009186). DC, PB, and EH report grant and non-financial support in the form of manuka honey from Comvita NZ Limited and Capilano Honey Limited; RS is employed by Comvita NZ Limited, which trades in medical grade manuka honey (Medihoney). The rest of the authors declare that the research was conducted in the absence of any commercial or financial relationship that could be construed as a potential conflict of interest. ESBL, extended spectrum β-lactamase; MBC, minimum bactericidal concentration; MGO, methyl glyoxal; MIC, minimum inhibitory concentration; MRSA, methicillin-resistant Staphylococcus aureus; MRSE, methicillin-resistant Staphylococcus epidermis; NPA, non-peroxide activity; VRE, vancomycin-resistant Enterococcus. Bassam, Z., Zohra, B. I., and Saada, A.-A. (1997). The effects of honey on Leishmania parasites: an in vitro study. Trop. Doctor27, 36–38. Cooper, R. A., Molan, P. C., and Harding, K. G. (1999). Antibacterial activity of honey against strains of Staphylococcus aureusfrom infected wounds. J. R. Soc. Med. 92, 283–285. George, N. M., and Cutting, K. F. (2007). Antibacterial honey (Medihoney): in-vitro activity against clinical isolates of MRSA, VRE, and other multiresistant gram-negative organisms including Pseudomonas aeruginosa. Wounds 19:231. Molan, P. M. (2008). An explanation of why the MGO level in manuka honey does not show the antibacterial activity. New Zealand Beekeeper 16, 11–13. Regulski, M. (2008). A novel wound care dressing for chronic leg ulcerations. Podiatry Manag. 27, 235–246. Shahzad, A., and Cohrs, R. J. (2012). In vitro antiviral activity of honey against varicella zoster virus (VZV): a translational medicine study for potential remedy for shingles. Transl. Biomed. 3:2. Sojka, M., Valachova, I., Bucekova, M., and Majtan, J. (2016). Antibiofilm efficacy of honey and bee-derived defensin-1 on multi-species wound biofilm. J. Med. Microbiol. doi: 10.1099/jmm.0.000227 [Epub ahead of print]. Windsor, S., Pappalardo, M., Brooks, P., Williams, S., and Manley-Harris, M. (2012). A convenient new analysis of dihydroxyacetone and methylglyoxal applied to Australian Leptospermum honeys. J. Pharmacogn. Phytother. 4, 6–11.